Single Decade Miraculous Rosary Gift Set. Lourdes Water Tiger Eye Rosary Gift Set. Genuine Agate Lourdes Water Rosary Gift Set. Genuine Rose Quartz Lourdes Water Rosary Gift Set. Our Lady of Sorrows Rosary Rosary Gift Set. Miraculous Rosary Gift Set with Lourdes Water. St. Christopher & St. Pio Gift Set. Divine Mercy Rosary & Key Ring Gift Set. Swarovski & Crystal Lourdes Rosary & Water Gift Set. Lourdes Rosary Gift Set with Swarovski Element�Beads. Green Lourdes Rosary & Water Gift Set. Swarovski Crucifix & Rosary Gift Set. Olive Wood Acorn�Rosary Gift Set & Swarovski Crucifix. 925 Miraculous Swarovski Rosary Gift Set. Mother of Pearl Gift Set with 925 Sterling Silver Cross. Emerald Rosary - Mother of Pearl Gift Set. Christmas Rosary with Nativity Centerpieces Gift Set. Sterling Silver Cross & Lourdes Apparition Gift Set. Mens 925 St Benedict Pendant & Rosary Gift Set. Mens St Benedict Pendant & Rosary Gift Set. 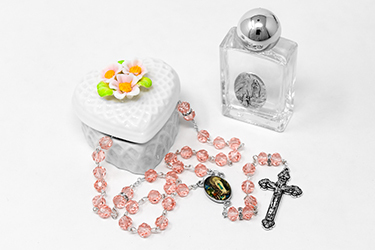 Lourdes Water Pendant & Rose Rosary Gift Set. Virgin Mary Holy Water Pendant & Rose Rosary Gift Set. 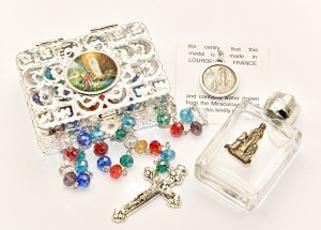 Beautiful Lourdes Rosary Box Gift Set.